﻿ Q276: How can I configure pricing for adults and children (also for different age groups)? FAQ Q276: How can I configure pricing for adults and children (also for different age groups)? First of all, you'll need to add new form items to your reservation form. In Settings / Reservation form layout add an item of type Number of adults. Now, go to Settings / Pricing Manager to define the prices. 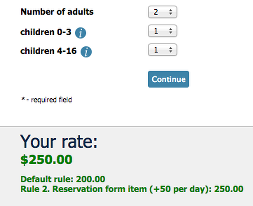 The first default rule will set the price per adult (and, in this case, per each day of the stay). In case we have just one field for all children, we'll simply need to add another rule of type Always true so that it will be always applied. For this rule we'll simply add 50 USD per day per each child present. Note the plus sign which is always required if you wish to increase the price calculated in the previous rules. Writing only 50 would override the price and not charge anything for the adults. In case you have different age groups, you'll need a different rule, of type Reservation form item. Choose the age group dropdown (in our example, children 4-16) and leave the value empty. This will always apply the rule (so it's kind of an always-true rule as well) but it will also let you use a special notation, e.g. 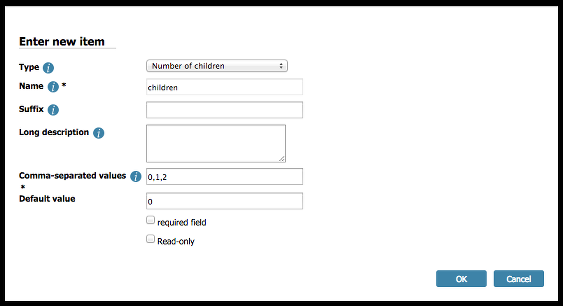 +50x where x represents the actual value of the children 4-16 dropdown, which will be multiplied by 50 and added to the price calculated so far. Of course we could define more rules for different age groups (whether adults or children) but in this example we don't want to charge for small children (0-3 years old). It's always a good idea to click on Test pricing rules in order to see if the rules were set up correctly. The comment under the price tells you which rules were applied (in this case, both the default rule and rule 2) and how the price is being modified by each subsequent rule. If the end price is not correct, you will see which rule includes the error.